"Numerous calls were received by emergency services for assistance, particularly in the Stroud and Dungog areas," a NSW Police statement said. "During the morning a woman and two men were located deceased within the Dungog township. "The circumstances surrounding their deaths are still to be determined." Hunter police commander Jeff Loy said several homes had been washed away in Dungog. A school bus had been washed off a road near Maitland, and several Hunter homes were split in half by falling trees. The Bureau of Meteorology reported 119 millimetres of rainfall in the 24 hours until 9:00am at the Sydney Observatory Hill - the wettest 24-hour period since 2002. The SES says "unprecedented" wind gusts of up to 135kph have lashed the Hunter, with dozens of houses losing their roofs, thousands of trees down, and more than 200,000 properties without power across the state - the largest outage since 2007. Now forecasters have warned that another low pressure system is forming off the Central Coast and is expected to move into the Hunter and coastal areas this afternoon. Anthony O'Brien from Ausgrid said the number of properties affected by power outages was continuing to grow. "As we sit here I can see the system updating and more reports of power lines being brought down," he said. Ausgrid crews were battling to repair the damaged network but it is expected that some households' electricity may not be restored until Wednesday. Brett Moore from the Transport Management Centre said the best approach may be to stay home today. "If you don't need to be out on the road, probably best not to be." 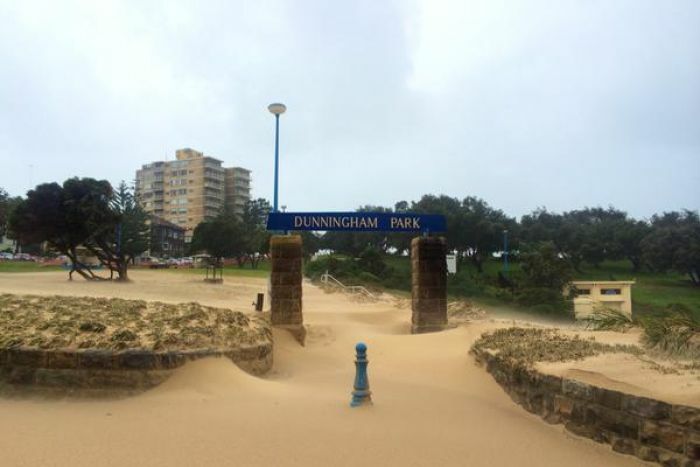 Courts are closed in Newcastle, East Maitland, Singleton and Wyong due to the wild weather, NSW Justice said.